Please note that photographs will be available (for free) very soon. Please keep an eye on the Whole Hog facebook page for more information. For everyone taking part in this Sundays Suffolk Whole Hog! The following are important race details for the Suffolk Whole Hog taking place this weekend on Sunday the 19th October 2014. Parking is to be arranged in the main area of Wantisden Hall. Please navigate to Wantisden Hall and you will then pick up EVENT PARKING signs once you are close by. Easily accessible from both North and West via the A14 and A12. Registration – please ensure you arrive with plenty of time to register! 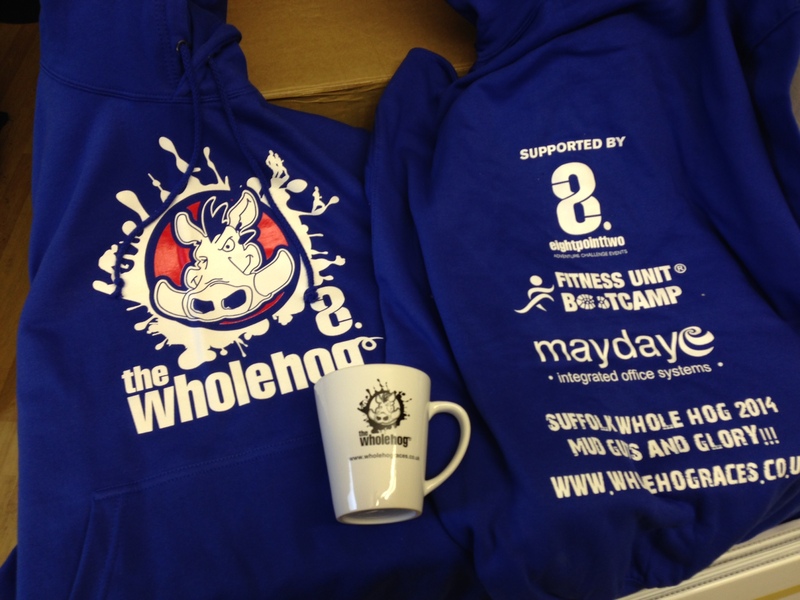 We have the following Whole Hog merchandise for sale on the day (please note that we can only accept cash). The race you have entered is a wet and muddy 7 mile obstacle course! We therefore recommend that you wear old clothes that you don’t mind getting filthy! Off road trail shoes (or fell shoes) are best. We suggest long sleeved tops and leggings to cover knees. Gloves can also be a good idea (but don’t wear your best leather driving gloves)…. Make sure that you arrive with plenty of time to get organised, register and get to the starting area. The race briefing will be at the registration area. Toilets will also be available. Don’t forget to bring a towel and a set of dry clothes (showers won’t be available).